Constant research for exclusive touches has led to the creation of a lamp with a personalised, unique and exquisite shape: Multispot. The particular modular system was designed to give the architect the possibility of establishing the heights at which to position diffusers and lighting points, thus adapting the lamp to any project. The product can be perfectly adapted to suit any environment thanks also to the range of different sizes of ceiling rose available. It is ideal for adding a touch of glamour and charm to large areas. On request, Multispot lamps can be entirely customized. 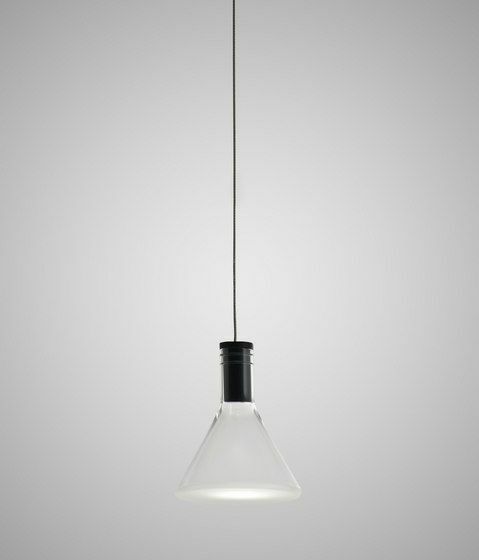 The Polair collection is made up of pendant lamps for indoor use. The shades, in various sizes, are available in white powder coated aluminium and come with a standard amount of lighting points or can be completely customized on request. The Polair diffusers come in three electric cable lengths, and are composed of borosilicate (Pyrex) glass cylindrical elements, with a sandblasted base. The energy voltage is LED.